Having played in 2,130 consecutive games, Lou Gehrig’s streak–and career–came to an end on April 30, 1939. Gehrig went 0-for-4 in his final appearance against the Senators. His performance had been declining for some time, and Gehrig would later be diagnosed by the Mayo Clinic with amyotrophic lateral sclerosis (ALS), now more commonly known as Lou Gehrig’s disease. During his seventeen-year career with the Yankees, Gehrig compiled a .340 batting average and 493 home runs. What happens when you forget to pack your uniforms? The Cincinnati Reds had this very dilemma on April 29, 1913, when they were set to play the Cubs in Chicago. Fortunately for the Reds, the Cubs’ crosstown rivals, the White Sox, loaned out their uniforms for the contest. Unfortunately for the Reds, the White Sox unis didn’t bring them any luck, as they lost to the Cubs, 7-2. The Baseball Attic has been nominated for the Sunshine Award! I want to express my deepest gratitude to Tom von Kapherr of Cats at the Bar for this nomination! I must confess, when I found out about the nomination, my initial reaction came in the form of a gigantic question mark in a thought bubble floating over my head. I did a little research, and I’m still pretty hazy about the details of the award and whether or not it really is a thing (honestly, it feels very much like a meme), but it definitely seems worth accepting the nomination. If nothing else, I am tickled to death and extremely humbled by the idea that this blog has inspired something like this in the first place. It appears that the conditions for accepting this nomination include answering these ten questions about myself, and then nominating ten other blogs and giving their authors ten new questions to answer in turn. 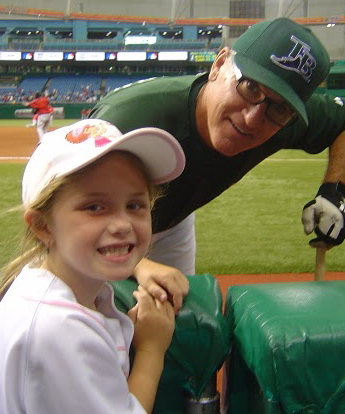 Honestly, I have no idea what happens next in the process after this post, but it does give me an excuse to talk a little about myself outside of the context of baseball. Onward to the questions! 1) Would you or have you ever gone skydiving? Yes! A friend and I did a tandem jump a few years ago (we each paired up with a professional, of course). Much to my surprise, the free fall did not feel like falling at all, but rather, it felt like floating. I suppose that’s normal when you’re thousands of feet in the air reaching speeds of approximately 130 miles per hour. 2) Have you ever eaten an insect? Not intentionally. Some say that people eat copious amounts of spiders over the course of their lifetimes, while others say this is merely a perpetuated urban legend. I almost ate a honey bee once, after it flew into my mouth on the playground when I was in the first grade. Fortunately, I managed to spit it out without getting stung, but the bitterness stayed in my mouth the rest of the day. 3) What is the most exotic pet you’ve ever owned? I actually never had a “real” pet until this past August, when I adopted the most adorable (and feisty) kitten in the world and named her Minerva. I have also owned some fish, including a string of bettas over the last decade, each of whom I have given the coolest name I could think of at the time of their adoption (my current betta is Alexander the Great). Outside of that, my brother and I used to chase after, and sometimes catch, lizards during our childhood, but I don’t think that really counts. Tough choice. I would have to say chicken. Unless I can count shrimp, crab, and lobster as “fish,” but that would be cheating. 5) If you could, would you rather be able to fly or breathe under water? Definitely fly. Breathing under water certainly has its advantages, but living in Kansas, the opportunity to use it rarely presents itself. Flying, on the other hand, could come in handy virtually anywhere. 6) You find a wallet in a cab, what do you do with it? If the wallet has ID in it, I would get in contact with the owner myself and arrange for its return. If I can find an address, even better, because then I could just mail it without the embarrassment of exaggerated gratitude. If the wallet has no identification, however, I would turn it in to the driver and hope that he/she is honest enough to pass it on to Lost & Found. 7) How do you feel about being nominated for this award? I had not read ahead on the questions when I said earlier that I was “tickled to death and extremely humbled” by this nomination, but now that it comes up, I can’t think of a better way to say it. When I started this blog a little over a year ago, I never imagined that it would grow to the extent that it has. I thoroughly enjoy keeping up with it, and I’ve learned a lot in the process as well. I find it a tad overwhelming that others find as much enjoyment in it as I do. 8) Who do admire most in the world, living or dead? My dad. He is easily the most disciplined and responsible human being I have ever met, and he goes out of his way to help people when they need it. I pretty much spend my life trying to emulate him. 9) Do you separate your laundry? Growing up, my mom always meticulously separated our laundry, and she taught me to do the same. When I got to college, however, I realized that it was much easier, not to mention cheaper, to throw everything into a single load. These days, I only separate the laundry if something needs bleached or if I otherwise worry about colors bleeding. 10) In which month were you conceived? 9. Photo of the Day, Etc. 1. What is the weirdest thing you’ve ever eaten? 3. How do you go about picking topics for your blog posts? 4. Are you addicted to caffeine? 5. Are you a morning person? A night owl? 6. What is the best book you’ve ever read? 7. What is/was your favorite subject in school? 9. What is the best sporting event/concert/other performance you have ever been to? 10. Have you ever gotten stitches? In high school I wrote an essay on baseball and my teacher told me I had to rewrite it on a more serious topic. So I wrote an essay about the World Series and my teacher gave up. 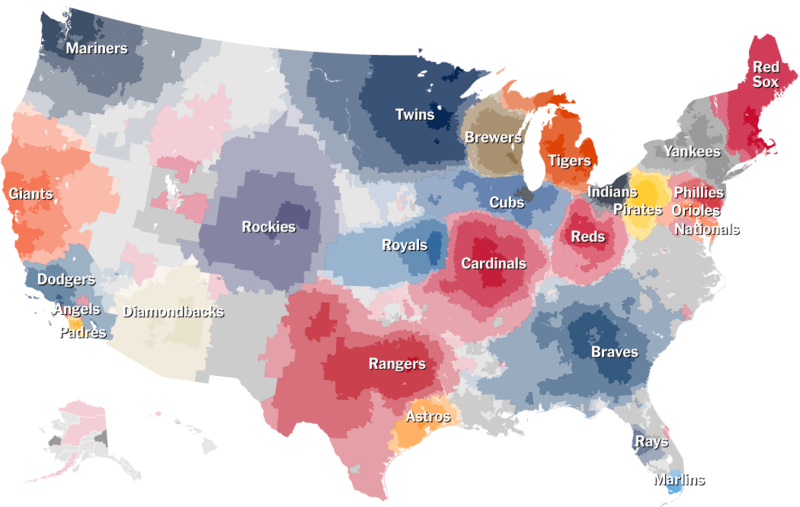 Feeding my seemingly growing obsession with baseball fan maps, the New York Times published this interactive map a couple days ago — again, based on Facebook data — that allows us to to zoom in on which team fans root for, down to the zip code. For example, I can tell you that my hometown contains 69% Royals fans, and my current neighborhood comprises 49% Royals fans. After the Royals, 12% of my current neighbors root for the St. Louis Cardinals, while 7% pull for the Boston Red Sox (…really?). Things get especially interested along both coastlines, where a greater saturation of teams results in a greater conflict of loyalties. In addition to the large, nationwide map, the Times generated fourteen smaller maps, highlighting baseball’s biggest rivalries. If you would like to read the article and explore the interactive map, just click on the image below, and it will direct you to the site. Enjoy! Branch Rickey: One of baseball’s best GM’s? As a player, his career never amounted to much. Nevertheless, the name Branch Rickey resonates far and wide, especially in association with the name Jackie Robinson. And while the breaking of the color barrier blazed the trail to integration, both in baseball and throughout America, Rickey’s contributions do not stop there. We can also thank Rickey for drafting Roberto Clemente in the 1950s. Clemente went on to become Major League Baseball’s first Latino player to win a World Series as a starting player, to win the World Series MVP award, and to win the National League MVP award. Clemente also became the first Latino player inducted into the Hall of Fame. In addition to these integral changes, Branch Rickey also created baseball’s minor league farm system while serving as president of the St. Louis Cardinals. This innovation allowed him to develop players within the organization to get them ready for Major League competition. St. Louis became one of baseball’s best teams during this period, and before long, teams throughout Major League Baseball adopted his system. It revolutionized the game as people knew it. When he moved on to Brooklyn, Rickey also created the first full-time spring training facility, which allowed the Dodgers to train and analyze prospective players in one place. This system also went on to get adopted by teams throughout baseball. One could argue that all these changes would have occurred in baseball eventually, with or without Rickey. And yes, I agree that they were all bound to happen. But change always has to start somewhere, and in the world of baseball, Branch Rickey served as the catalyst for these revolutionary developments. 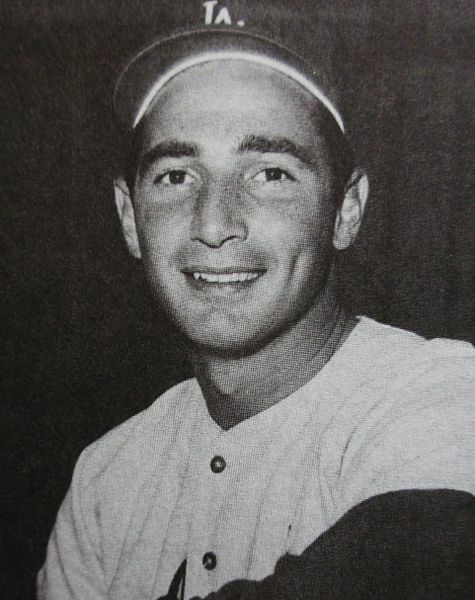 On April 24, 1962, Dodgers pitcher Sandy Koufax struck out eighteen hitters, tying a modern Major League record for most strikeouts in a single, nine-inning game. It was the second time in his career that Koufax accomplished the feat. The record has since been broken, with five players striking out 19 batters in a single game, and twenty-strikeout performances by Roger Clemens (twice) and Kerry Wood.